Now I am no gloss fan at all, in fact I would say that a strong 98% of all the glosses I have tried I have really hated. However today I thought I would show you the three glosses that I can wear without me wanting to take it straight off my lips. These three are not sticky and with the Clarins one I actually feel like I can wear them with my hair down without everything getting a nasty sticky mess. These are something that I have only very recently tried as I'd heard so much about them and I can see why. 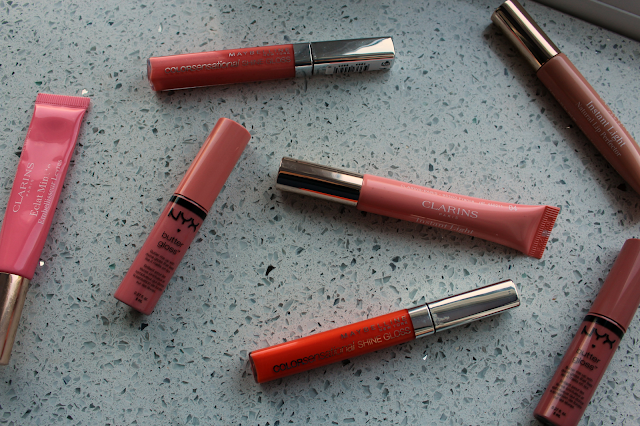 These are really smooth glosses that don't feel sticky at all. These are heavily vanilla scented so if you aren't a fan of heavy scents then these might not be for you however other than that I really haven't got anything bad to say about them. I love the fact that the packaging matches the shade in the tubes as it makes it super easy to find them in my collection. These are the best of you want a bright gloss, these are probably out of the three the stickiest however they are in no way as sticky as a lot of the glosses I have tried. They have a typical fruity scent that a lot of glosses have. Something I like about these is how pigmented they are. I find a lot of glosses tend to lack in pigment however these really pack a punch. I'd put these somewhere on the scale between a gloss and a balm, these are very sheer and in all honesty i'm not sure you need more than one shade as they are so sheer. That being said I don't have any of the darker shades. As I said before these are not sticky at all. The one thing I'm not a fan of with these is the applicator the sponge kind of grosses me out as I feel like it collects all the extra gloss. I'm not a big fan of lip glosses either, I hate the way they feel on my lips. As I have quite dry lips however, I like to wear them over the top of a matte lipstick. The NYX butter glosses sound lovely, I adore the smell of vanilla!